Mechanics Institute, National Taiwan University, Taipei, Taiwan. 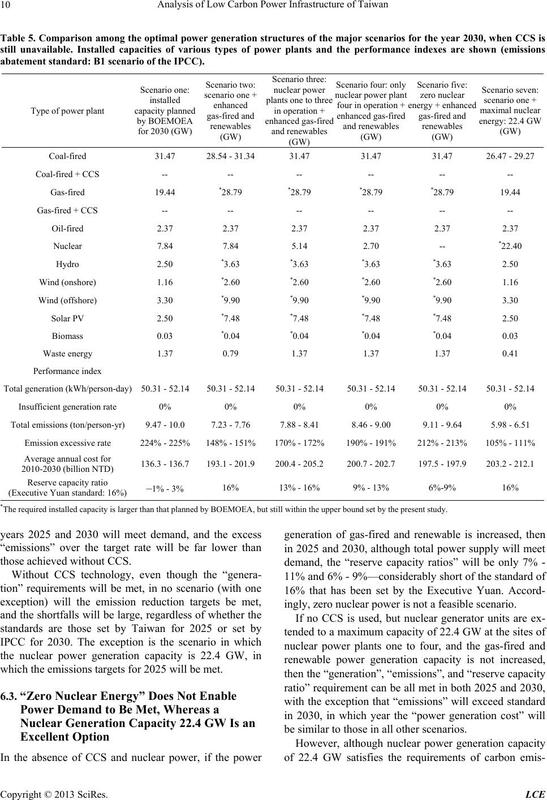 power generation scenario will reach the carbon abatement targets for those years. about 0.03 degrees per year . for a marked worsening of global weather . of increase between 2000 and 2006 was 1.93 ppm/yr . about 47 billion tons of carbon dioxide equivalents (CO2e). 23 billion tons in 2100 .
clean energy, and the ensuring of a stable energy supply. 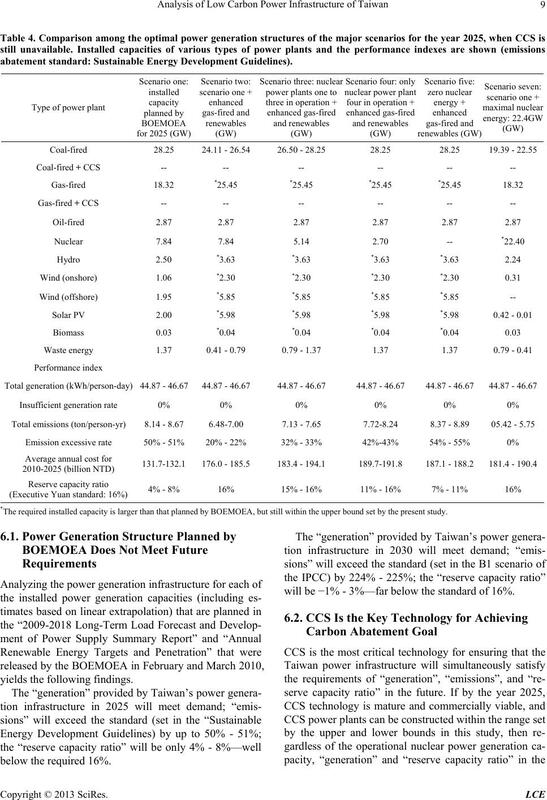 of Taiwan must reduce to 9.5 tons per capita in 2025.
amount of power generated and reserve capacity ratio. in the manufacturing of turbines, solar panels and so on. expected to fall to 15 g-CO2/kWh . to their larger foundations) . equals that absorbed by the plant during its growth period. for about 35% of emissions . would be around 0.8 kg-CO2/kWh . ture CCS, to reduce financial risk. 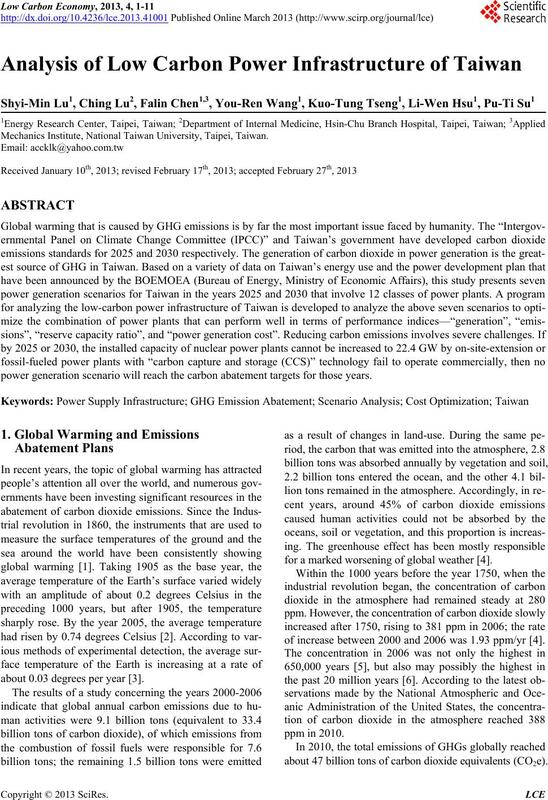 waste incineration are around 1.36 kg-CO2/kWh. Table 1 presents the above data. petroleum products (51.82%), and natural gas (8.62%). supply is a serious concern for Taiwan. ergy reserves in Taiwan (in kWh/d/p). that was generated in Taiwan in 2009 (27.32 kWh/d/p). quired energy supply, and so will remain very important. 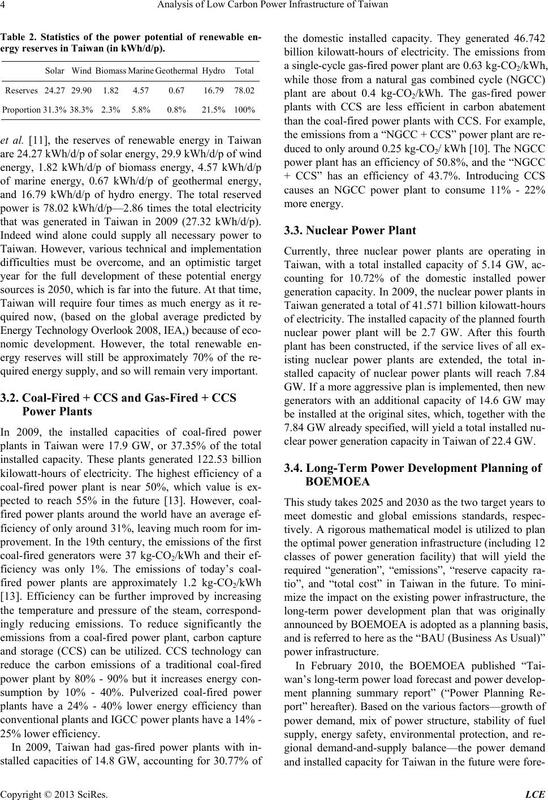 clear power generation capacity in Taiwan of 22.4 GW. 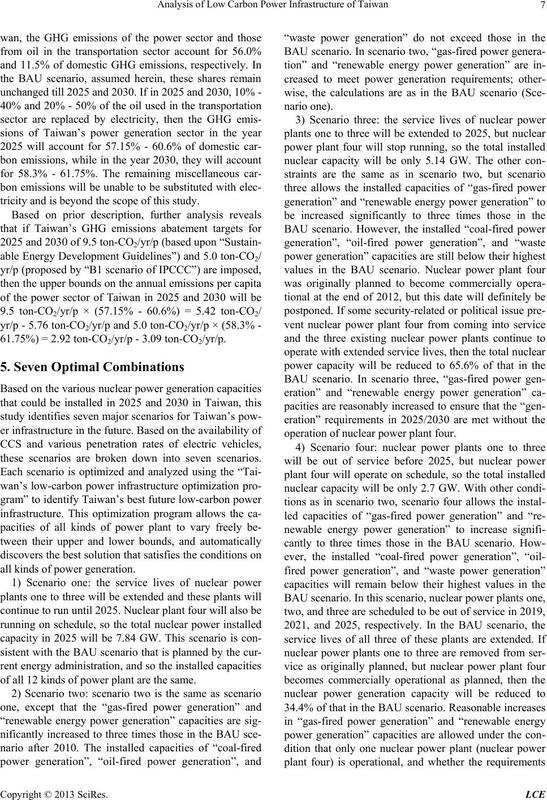 scenario will be based on the “Power Planning Report”. the BOEMOEA and linear estimates). nologies that Taiwan has not yet planned to use. ratio” to be satisfied, according to following criteria. generation structure can be determined. the power supply between 2008 and 2018 will be 2.53%. placing gasoline-fueled vehicles with electric vehicles. 27% of vehicles in France will be electric in 2025. MKLOE, with an average annual growth rate of 0.33%. hours of electricity in 2025 and 2030, respectively. 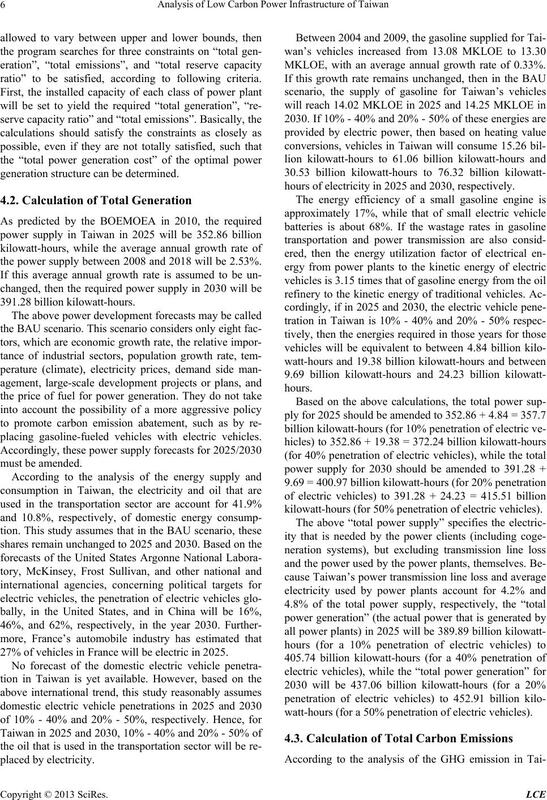 kilowatt-hours (for 50% penetration of electric vehicles). watt-hours (for a 50% penetration of electric vehicles). tricity and is beyond the scope of this study. 61.75%) = 2.92 ton-CO2/yr/p - 3.09 ton-CO2/yr/p. these scenarios are broken down into seven scenarios. all kinds of power generation. of all 12 kinds of power plant are the same. operation of nuclear power plant four. for 2025/2030 can thus be met is determined. ginal plant sites can meet demand in 2025/2030. 40% higher than that in scenario one. abatement standard: Sustainable Energy Development Guidelines). *The required installed capacity is larger than that planned by BOEMOEA, but still within the upper bound set by the present study. will be −1% - 3%—far below the standard of 16%. abatement standard: B1 scenario of the IPCC). which the emissions targets for 2025 will be met. 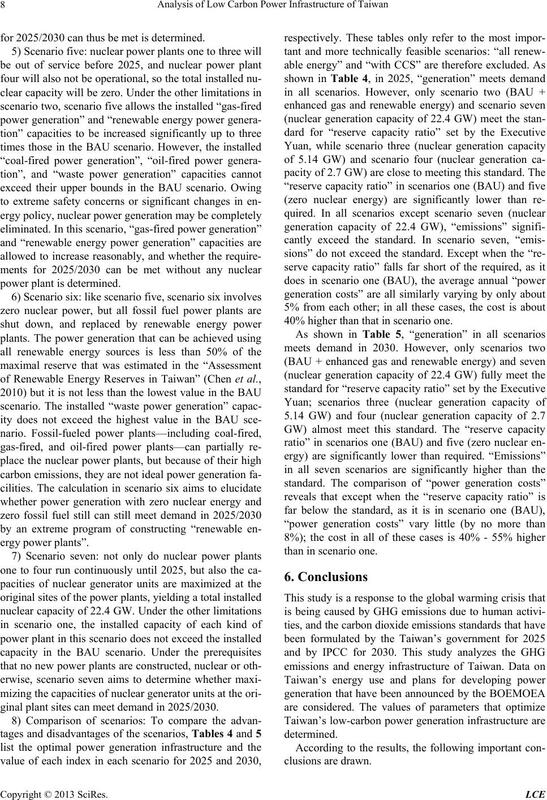 ingly, zero nuclear power is not a feasible scenario. be similar to those in all other scenarios. issues involved are beyond the scopes of this study. Council, Taiwan, for financially supporting this research. J. T. Houghton, Y. Ding, D. J. Griggs, M. Noguer, P. J. Research Letters, Vol. 36, 2009, Article ID: L15708. of the National Academy of Sciences, Vol. 104, 2007, pp. No. 5752, 2005, pp. 1313-1317. Nature, Vol. 406, No. 6797, 2000, pp. 695-699. B. Metz, O. R. Davidson, P. R. Bosch, R. Dave and L. A. 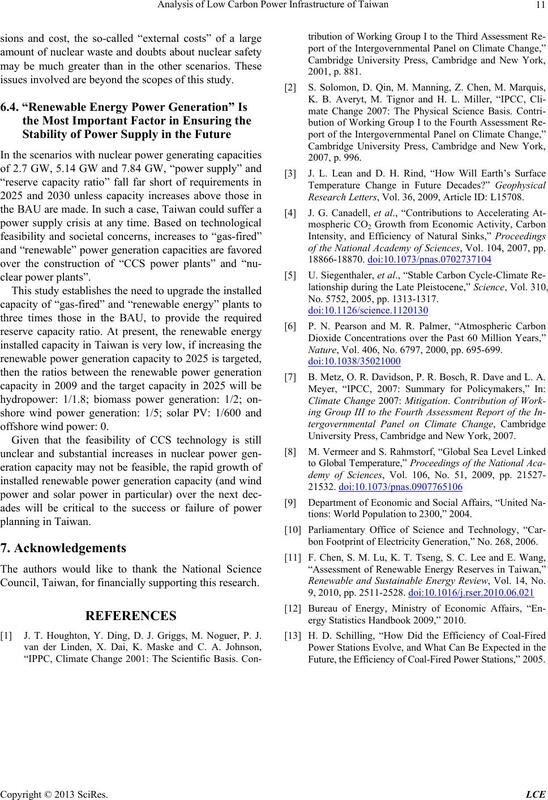 University Press, Cambridge and New York, 2007.
tions: World Population to 2300,” 2004.
bon Footprint of Electricity Generation,” No. 268, 2006. 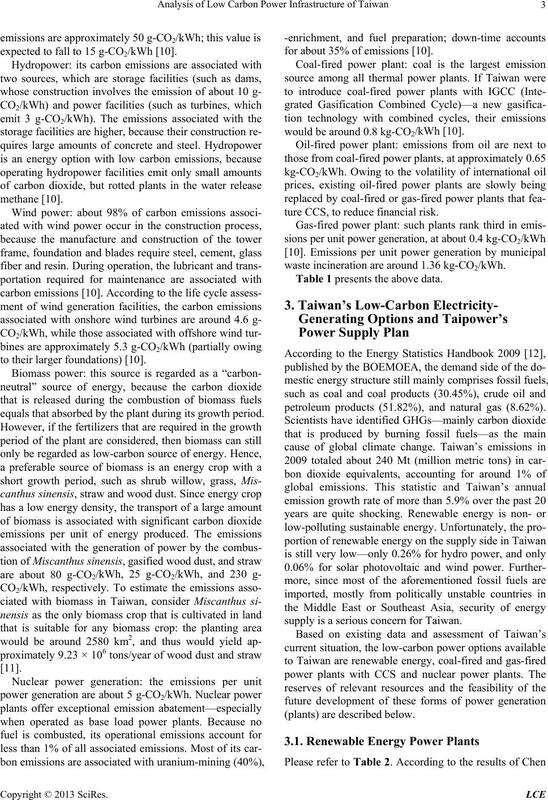 Renewable and Sustainable Energy Review, Vol. 14, No. 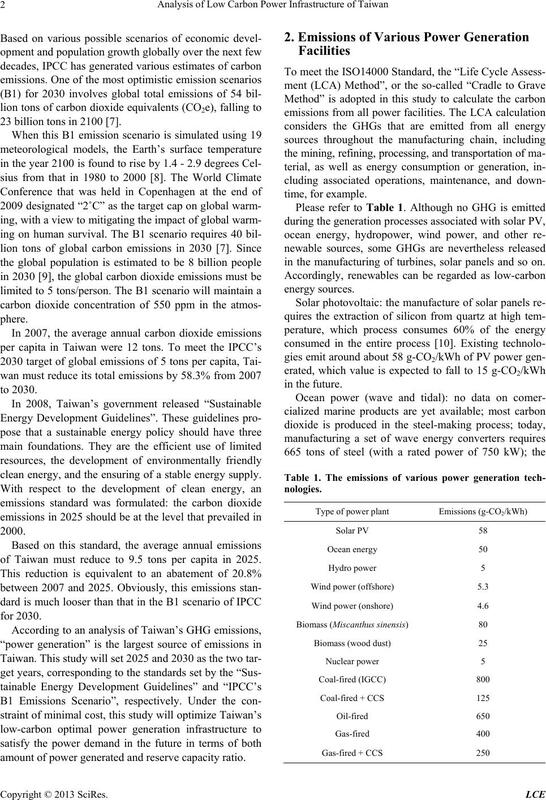 ergy Statistics Handbook 2009,” 2010. 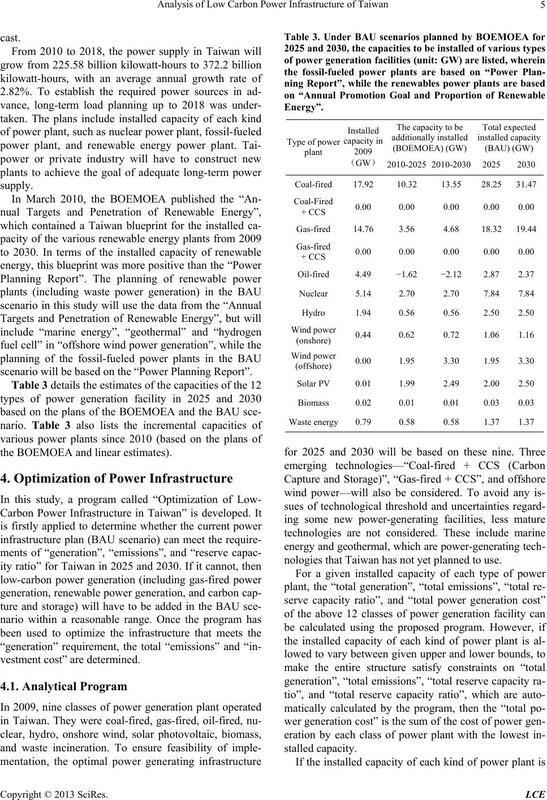 Future, the Efficiency of Coal-Fired Power Stations,” 2005.